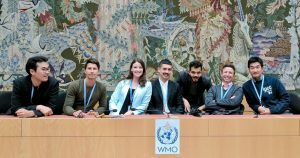 Nathaniel Matthews-Trigg, MPH (second from right), sits with fellow World Meteorological Organization summer interns in Geneva, Switzerland where he spent 3 months with the World Health Organization and World Meteorological Organization Joint Office for Climate and Health. His internship focused on helping to develop and implement the Global Heat Health Information Network (GHHIN) – an online platform, forum, and synthesis report focused on the effects of extreme ambient heat on human health. Nate recently became the first to complete the Graduate Certificate in Climate Change and Health.